One of the main topics of cultural conversation during the last decade was the supposed "fertility crisis," and whether modern women could figure out a way to way to have it all-a successful, demanding career and the required 2.3 children-before their biological clock stopped ticking. Now, however, conversation has turned to whether it's necessary to have it all (see Anne-Marie Slaughter) or, perhaps more controversial, whether children are really a requirement for a fulfilling life. The idea that some women and men prefer not to have children is often met with sharp criticism and incredulity by the public and mainstream media. In this provocative and controversial collection of essays, curated by writer Meghan Daum, thirteen acclaimed female writers explain why they have chosen to eschew motherhood. Contributors include Lionel Shriver, Sigrid Nunez, Kate Christensen, Elliott Holt, Geoff Dyer, and Tim Kreider, among others, who will give a unique perspective on the overwhelming cultural pressure of parenthood. Meghan Daum is the author of the essay collection The Unspeakable: And Other Subjects of Discussion. 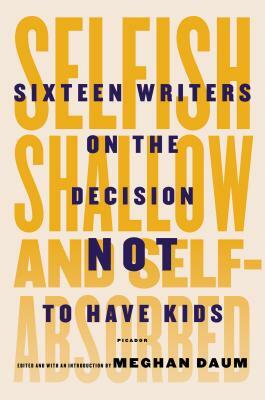 She is also the editor of the anthology Selfish, Shallow, and Self-Absorbed: Sixteen Writers on the Decision Not to Have Kids. Her other books include the essay collection My Misspent Youth, the novel The Quality of Life Report, and Life Would Be Perfect If I Lived In That House, a memoir. Since 2005, Meghan has been an opinion columnist for The Los Angeles Times, writing on political, cultural, and social affairs. She has contributed to public radio's Morning Edition, Marketplace, and This American Life, and has written for numerous publications, including The New Yorker, Harper's Magazine, GQ, Vogue, Harper's Bazaar, and The New York Times Magazine. She lives in Los Angeles.